Tastes change through the ages. As a child I could not stand the bitterness of coffee, but now you wouldn’t want to engage me in conversation before my second cup. I also used to love maple sugar candy, a confection so sweet it made me gag when last I tasted it. As it is with food and drink, so it is with movies. Recently I attempted to watch The Goonies and I turned it off halfway through. It wasn’t the same. 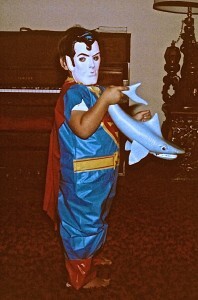 But in 1985 I was a Goonie. 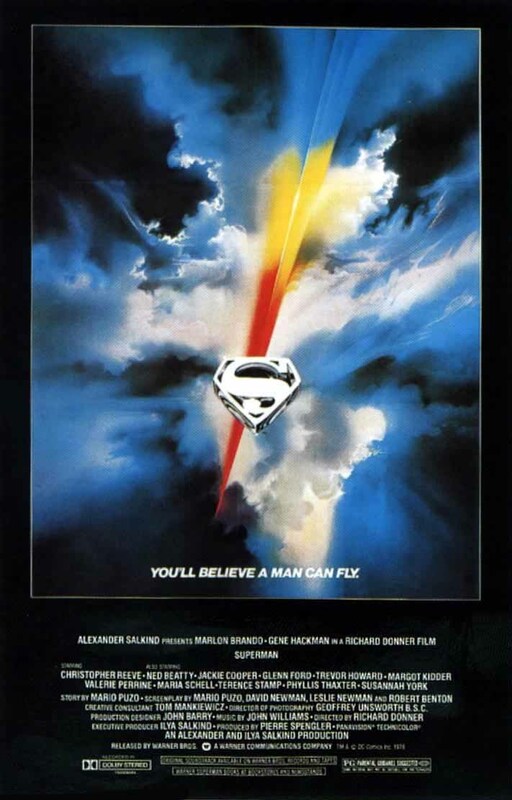 Executive produced by Steven Spielberg and directed by Superman’s Richard Donner, Goonies told the story of a group of pre-teen boys who lied to their parents, snuck out of the house, and saved the day. 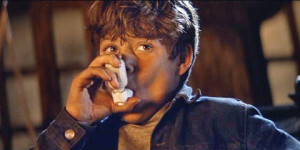 It was a film that continued a narrative Spielberg introduced in E.T. : a child outsmarting his parents and undertaking an adventure that would solve a family crisis and bring everyone closer together. Surely every boy on the playgrounds of every school across America was the target audience for Donner’s film. 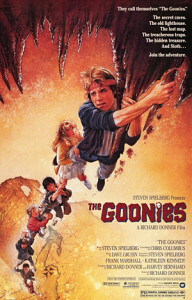 Fat or thin, with or without braces, fast-talking or shy, there was a Goonie on screen with whom children and young teens could connect (Or at least every white child; the film lacked in diversity, with the only non-white child being an uncomfortable Asian stereotype). Through a shared lack of oxygen, I identified with Astin’s Goonie the most. 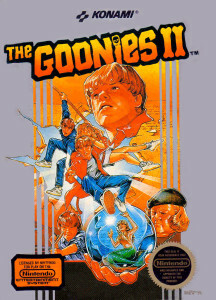 For me, just 10 years old, I looked at the screen and saw myself as Mikey, the lead Goonie. Both of us were prone to flights of fancy, both of us would come up with crazy plans that often ended with my friends and I getting grounded, both of us still believed in the fantastical, and, hey, we were both asthmatic. I was thrilled as the Goonies dodged booby traps and slid down a waterfall. 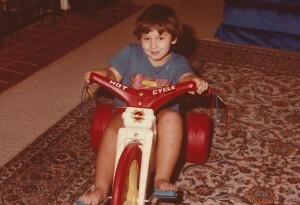 I rocked out to the soundtrack featuring pop stars like Cindi Lauper and The Bangles. I shuddered when Chunk was locked in a room with the monstrous Sloth, and then cheered when the two became best friends and saved the day. I was engrossed as I watched the Goonies not only outsmart their parents, but also overcome the criminal Fratelli family. Truly this was a kid-power film if ever there was one! At the time I didn’t see the movie for what it was: Indiana Jones for the playground set. Just look at all the booby traps, the majority of The Goonies could have been filmed on remnants left over from Temple of Doom. Instead, I just went with the Goonie kids on their wild adventure to find One-Eyed Willy, and left the theater feeling that children could do anything. Parents were but unnecessary obstacles that tried to downplay the magical nature of the world. This was the message I learned from so many films, from E.T. to Explorers to Cloak and Dagger to The Last Starfighter; but it was Goonies that drove it home. My childhood friends and I started to have our own misadventures, including the time we tried to catch some teenage drug-dealers by the mall, or when we started investigating ghosts that may or may not have haunted my house (both of these stories ended in humiliation and ruin). A couple years later my dream of Goonies 2 came true–but in a Nintendo game. 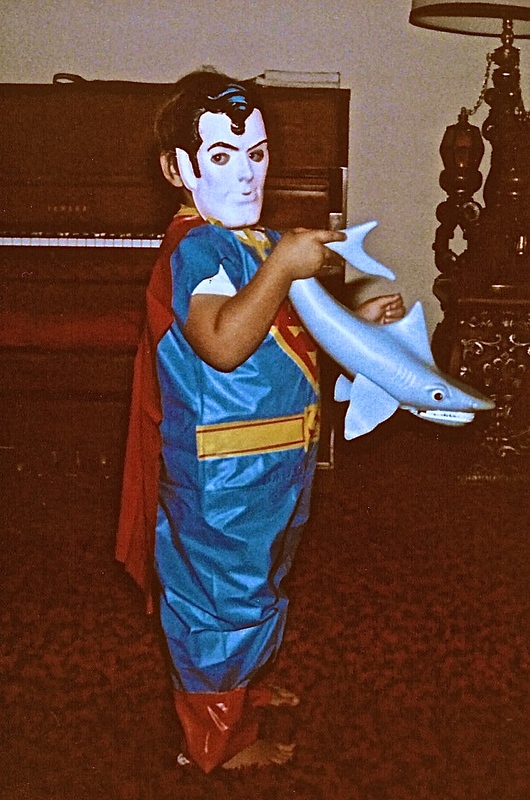 My script was better; it didn’t have needless mermaids. 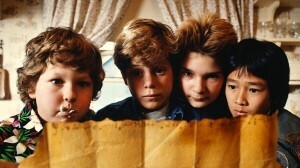 Even more though, if children could do anything, why couldn’t we actually be Goonies? 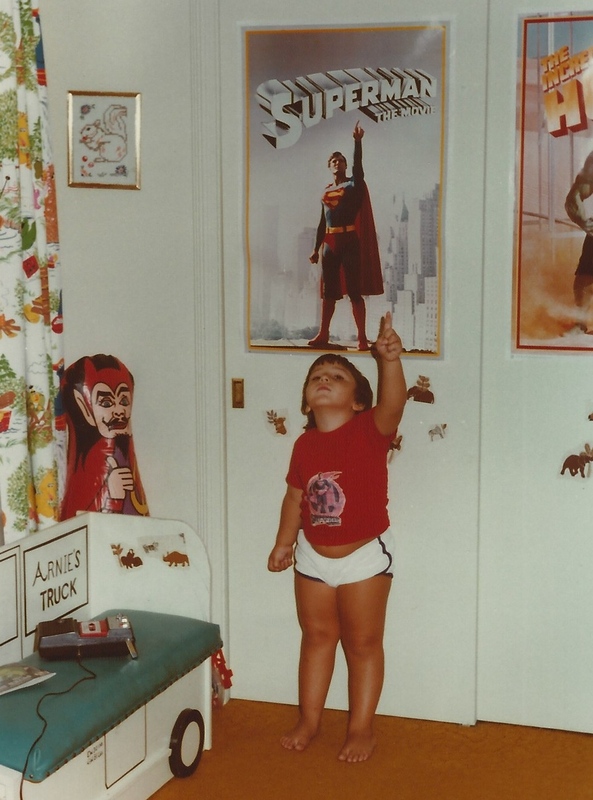 By age 10 I was familiar with moviemaking — having watched many behind-the-scenes TV specials. I picked up movie magazines that had interviews and profiles with the actors and directors involved. The movie Clue, with its multiple, random endings, even started to give me ideas about marketing. Not understanding the struggle child actors face trying to break into Hollywood, I was resentful of the Goonies casting and what I considered “Hollywood nepotism.” My Goonies Official Film Magazine made me realize all the Goonies were either actors who had been in other films (Corey Feldman and Jonathan Ke Quan) or children of famous people (Sean Astin and Josh Brolin). Obviously, boys from Springfield, Illinois, had no chance of being cast. So I decided to make my own Goonies 2. It had to happen — a 10-year-old boy obsessed with watching movies would surely turn into an 11-year-old who wanted to make movies. My parents had an 8mm film camera for family movies and, at age 8, I’d already filmed Star Wars 4: The Return of Darth Vader. It’s a mostly ad-libbed, terribly embarrassing 10-minute-short that ended with Luke Skywalker and Darth Vader playing together in a swimming pool. But I was now older, wiser, and had dreams of filmmaking. Over the span of a month I hammered out a script for Goonies 2. The plot was simple enough: the jewels were not enough to save the homes and the Goonies had to go out and find even more money. 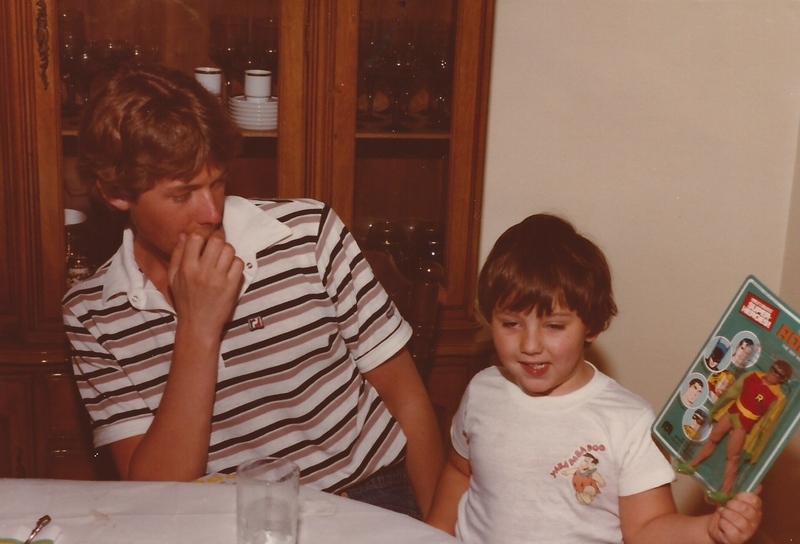 With my best friend Stuart’s help we cast our friends and family in various roles. A group of us even successfully recreated some of Data’s gadgets, including a spring-loaded, belt-worn dart gun. I clearly was not alone in this dream. Earlier this year I saw an episode of the ABC sitcom The Goldbergs in which lead character Adam tried the exact same thing! As this show is loosely based off the real life experiences of showrunner Adam Goldberg, I do wonder how many other kids across the country were inspired to grab cameras and try filmmaking because of this Donner-Spielberg adventure. 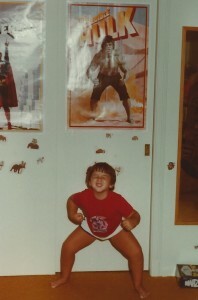 Fortunately, we never shot a frame of Goonies 2 — I doubt I could survive such embarrassment. The props were repurposed into a sixth-grade class performance for Goonies Cereal (we got an A). The script, typed in Wordstar on a NEC APC III, was lost when the 5.25-inch floppy was bent. My only memory of the script is my sister Linda saying she had memorized her dialogue. She was cast as Mama Fratelli, and all she did was scream. Rewatching The Goonies recently, I imagine my 10-year-old self really did tap into the core of that film, because it’s full of screaming, shouting, hollering, and various other loud noises. As an adult it was just an assault on my senses. The film is too sugar-fueled, too chaotic, and too… kiddie for me to enjoy. 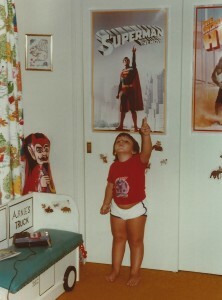 But I will always have those memories of being 10 and dreaming I could be a Goonie. So, if this were an episode of Now Playing Podcast, would I recommend The Goonies? Being a film critic means more than just saying “I liked a film.” Everyone has opinions, but an opinion is not a critique. While personal judgments will always play into a review, more must be taken into account in order to properly judge any creative work. Not every film is made for mass appeal, and sometimes focusing on a niche audience is key to a movie’s success. The Goonies clearly struck a chord with its core audience, and I can’t think of a higher recommendation than that.